Advertiser.ie - Fashion & Beauty round up - Galway bridal beats them all. Tracy Bridal, Galway’s longest established bridal boutique has won West of Ireland’s Bridal Boutique of the Year 2017 at the prestigious Irish Weddings Awards held in the Crown Plaza Hotel in Dublin last Sunday night. The Irish Wedding Awards aim to recognise and reward those in the wedding industry that work towards making your special day perfect. Voted for by the Irish public, the wedding awards are designed to recognise everyone's efforts, from the caterer that provides the delicious reception meal for your wedding, the DJ or band that adds the extra thrill to the atmosphere, or maybe the hair and make-up artist who made you look and feel on top of the world on your special day. 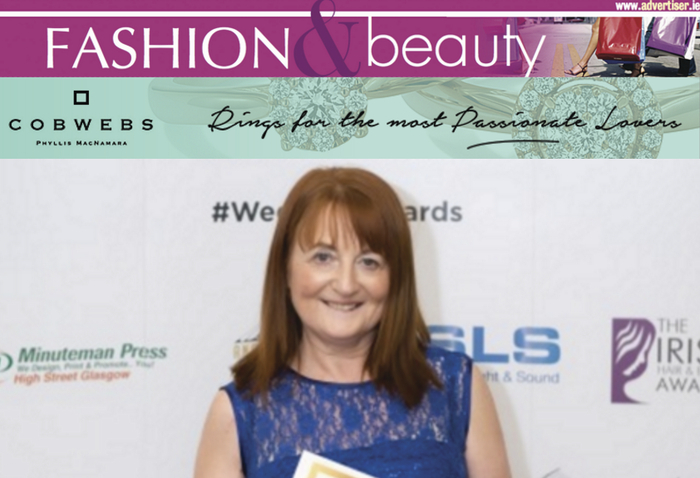 Owner of Tracy Bridal, Kathleen Tracy said, "We are absolutely thrilled to have won such a prestigious award, especially with so many other great boutiques in the category. We hadn’t expected to win, so hearing our name called at the awards ceremony was just fantastic and we’ve been overwhelmed since with the good wishes of our customers and the locality. This is a fantastic achievement for us. We are 27 years looking after our wonderful brides and we hope to keep going for many years to come." Tracy Bridal’s newly renovated store is a spacious 2000 sq feet with four private appointment areas full of the most beautiful wedding and bridesmaids' dresses and Communion wear. The store only stocks dresses from the best designers at the best prices. Labels include Maggie Sottero, Augusta Jones, Justin Alexander, Ronaldo Joyce, Sincerity, Essence, and Demetrius. Bridesmaid dresses come from Alvina Valenta, Belsoi, B2, and Ebony Rose collection. Its winning ingredients, include its elegant shop front, great-looking interior, complemented by exemplary customer service, and a vast selection of amazing gowns are what define Tracy Bridal’s offering. Having weathered two economic downturns, Tracy Bridal is now one of Galway’s longest established bridal shops. "Our success is attributed to our satisfied brides spreading the good word. The staff are continuously being praised for their ability to help pick that perfect dress without exerting pressure on the bride to purchase before she is ready to commit. We know this is the single most important outfit she will purchase make in her life." Tracy Bridal will be hosting a Wedding Soiree on Thursday March 23, where staff will be providing tips on getting ready for that special day, including a fashion show, beauty and skin regimes, hair and makeup inspirations along with getting you feeling the best way possible on your wedding day. Tracy Bridal invites all of its past, present, and future brides to come along for an informative evening. The boutique located on Bohermore Road, Galway, specialises in wedding dresses, bridesmaids', and Communion dresses, has become a must visit for brides to be on their wedding planning journey. For more information and updates visit website www.tracybridal.com, follow Tracy Bridal on Facebook, or call 091 380660 or pop into the store. Hair loss was once treated as a closed-door embarrassment, shared between women and their hair stylist. However, millions of women around the globe suffer from hair loss and thinning hair, even at a young age. Viviscal made here in Ireland is one of the most popular brands of dietary supplements for promoting hair growth, renowned for its capabilities to curb hair loss and thinning. It is endorsed by the growing army of celebrity fans including Jennifer Aniston, Gwyneth Paltrow, Reese Witherspoon, and Cate Blanchett, who use this product as part of their daily routine. Its most famous product in the range is the Viviscal Extra Strength supplements. This is primarily meant to help women with hair loss, but is also has another line of products specially formulated for the men. This blend of herbs and vitamins includes horsetail extract, flax seed extract, zinc and vitamin C, all of which have been known to have positive effects on hair quality, health, and growth. The most dominant ingredient in Viviscal is the proprietary marine protein complex, known as aminomar marine complex. This component is exclusive to Viviscal products; no other company possesses it, and it is the product of more than a quarter of a century of intensive scientific research. Aminomar marine complex combined with the vitamin blend work together to simultaneously reduce the levels of DHT in the scalp thus reducing the underlying causes of excessive hair shedding. In addition to this, it is also able to nourish your existing hair, especially during active or anagen growth phase of the standard hair growth cycle. Yes, genetic hair loss does occur in women with a percentage rate of about one per cent. However, in women, greater hair loss can be the result of many conditions and varied circumstances. These can include pregnancy, hormonal imbalance, stress, poor nutrition, medications, and illness. For some women, hair loss is temporary, but for many others, hair loss can be a lifelong struggle. The average person loses between 50 and 100 hairs daily. If you are shedding in small amounts, or hair is falling out at high rate – do not waste time. Transform your hair with a complete overhaul of your hair care regime. Get a jump on your ‘hair goals’ by starting your Viviscal Maximum Strength Hair Growth Supplements as part of your hair care routine. Available at all Matt O’Flaherty Chemists, a one month’s supply of Viviscal Maximum Strength Hair Growth Supplements is €49.95 or a three month value pack is now available at a special offer price of €99.95.